This model isn't a perfect model of a heart but it is a simple but fun way of demonstrating how the heat pumps blood and to learn a few of the names of the part of the heart. As you make your own model, I will take you through the steps there are some interesting facts to learn along the way. First put one of your balloons inside the other. This will be one of your ventricles because ventricles have thicker walls than atrium. Repeat STEP ONE to make a second ventricle. Cut your tubing so you have four 20cm long pieces. Stick one end of one of your 20cm long tubing into a single balloon. 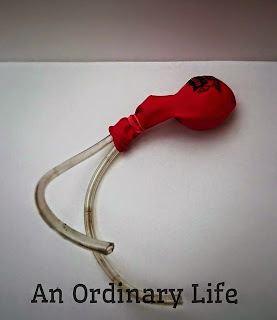 Get another tube and do the same so you have two tubes poking out of the balloon. Tightly wrap an elastic band round the neck of the balloon, so it's holding the two tubes in place. Wrap the electrical tape around the opening of the balloon so as to seal it so liquid can’t escape. You have an Atrium. We will call this your Left Atrium. The left atrium is one of the heart's four hollow chambers; it is located on the upper right hand side of the heart. Yes, the left is on the right. Because it is the left side of the heart from the posterior side. This is because, in anatomy it is labelled from the owner of the body's perspective. If I stand in front of you, to you my left atrium is on the right, but for me, it's on my left. The main roles of the left atrium is to act as a vessel for blood retuning from the lungs. The left atrium receives most of its blood supply from the left circumflex coronary artery. Drainage of the veins is carried out, in part, through left atrium's oblique vein. 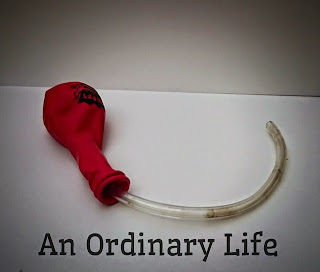 Using one of the tubes that is protruding from the Left Atrium, that you made it STEP FIVE insert the other end into the second single balloon. This will be your Right Atrium. Get a Third tube and stick it into the 'Right Atrium' balloon - you should have two tubes coming out of the neck of your balloon now. 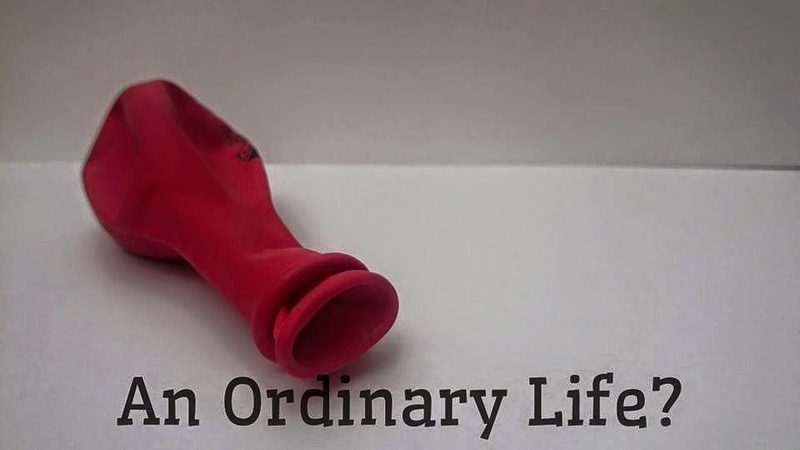 Wrap an elastic band around the next of this balloon as you did for the first. You now have your two atria. De-oxygenated blood enters the right atrium through the inferior and superior vena cavas. The right side of the heart pumps this de-oxygenated blood into the pulmonary veins which takes the blood around the lungs. At the lungs, fresh oxygen enters the blood stream, the blood moves to the left side of the heart, where the oxygenated blood is pumped to the rest of the body. During a human's lifespan, there is a major difference between a human foetus heart and that of a fully mature adult. A foetus will have a hole in the right atrium. This allows blood to flow straight through to the left atrium. This is really important for the circulatory health of the foetus: while in the womb, the foetus draws oxygenated blood from its mother. Once born, lungs become necessary and the connection between the two atria closes. 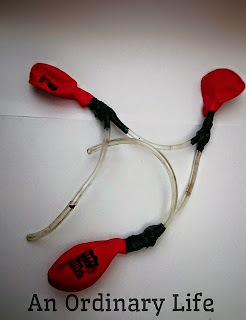 Get one of your doubled up balloons and fit the tube hanging from your left atrium and put it in the neck of your balloon. This new balloon will be your left ventricle. The left ventricle is one of four chambers of the heart. It is located below the left atrium, separated by the mitral valve. The left ventricle pumps oxygenated blood to tissues all over the body. After flowing into the left atrium and through the mitral valve, blood enters the left ventricle before it is pumped out through the aortic valve into the aortic arch and onward to the rest of the body. You have two options here, you can either colour 200ml of water with red food colouring or… To make it thicker, more like blood, you can add 1 tablespoon of corn flour to about 100ml water. Heat it up, whisking all the time, when it thickens properly take it off the heat and bit by bit add cold water until it has the thickness of thin custard. Now you will need your syringe. You don’t want to over fill your model otherwise you won’t see the liquid move and see how squeezing your balloon, which is what we are going to do to simulate the contractions that go on in the heart, moves the blood around the heart and in our bodies around our body too. 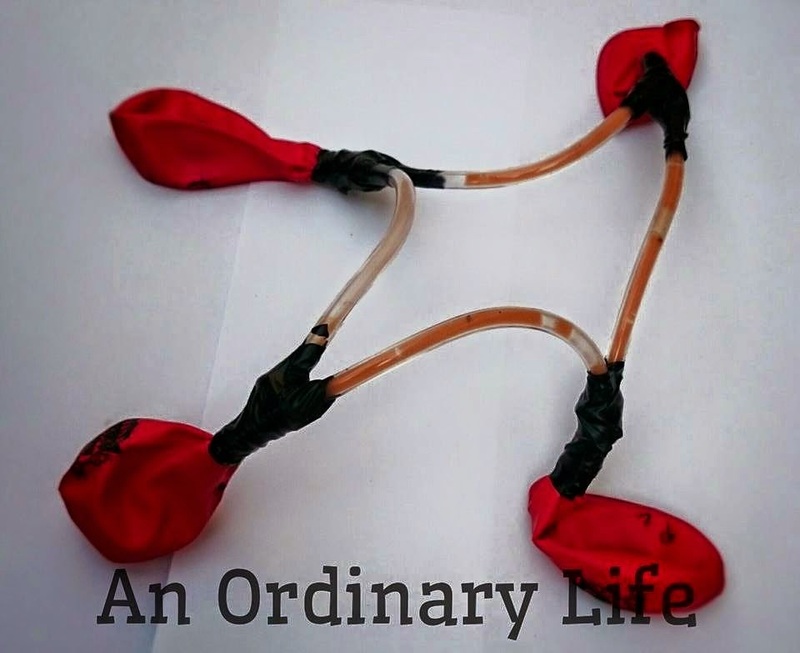 Get the other of your doubled up balloons and fit the tube hanging from your left ventricle and the right atrium and fit inside your doubled up balloon which is your right ventricle and use an elastic band to hold it and more tape to secure it and prevent the liquid from escaping. The right ventricle is the heart chamber that pumps the deoxygenated blood to th lungs. The right ventricle is one of four of the heart’s chambers and is located in the lower right portion of the heart below the right atrium and opposite the left ventricle. As deoxygenated blood flows into the right atrium, it goes through the tricuspid valve and into the right ventricle, which pumps the blood up through the pulmonary valve and through the pulmonary artery and to the lungs. When reading through text books we are often told that there are two circuits in blood circulation. The first pump goes to the lungs, where oxygen is picked up and the second pump sends the oxygenated blood to the rest of the body. In part this is true but after much research I have discovered that the circuit is one that is continuous and goes round in a figure of eight. The heart is seen as such a complicated organ, and the circulatory system and the heart was not understood for a long time as it was so difficult to see what is going on, even Leonardo Di Vinci gave up studying the heart after a while. It is difficult to understand the heart because once removed from a subject it soon stops beating and even then, trying to see what is going on inside the heart when it is beating is difficult because of all that blood that is so thick and impossible to see through. Some heart surgeons have now seen a beating heart and although we have two parts to our circulatory system as such, it continuously circulates through the figure of eight system as shown in the above diagram. It starts with the right of the heart. Blood that needs oxygen enters the heart via two large veins call the Inferior Vena Cava (IVC) and the Superior Vena Cava (SVC) pushing the blood that needs oxygenating into the Right Atrium. The Right Atrium contracts and the blood flows from the Right Atrium into the Right Ventricle through the open tricuspid valve. When the Right Ventricle is full of blood the Tricuspid Valve shuts to prevent blood flowing back into the Atrium while the ventricle then contracts. As the ventricle contracts, blood leaves the heart though the pulmonic value, to the pulmonary artery on to the lungs where it is oxygenated. Really a great advice on science equipment, all the one can refer it for their new ideas and the writing style is also good all the once can easily identify it. For relaxed writing experience choose thesis writing service provider. This is probably one of the easiest and most revealing ways to explain to a child how the blood moves in our body.